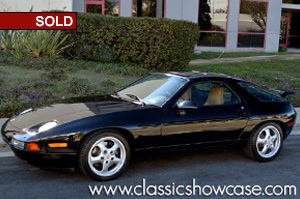 The 1994 Porsche 928 GTS was the final version of the 928s, and only 139 were imported to the United States in 1994. This two-owner example spent its entire life in Southern California, where it has had a major service performed 2,000 miles ago, which included installation of a new timing belt and water pump. It recently had a complete inspection and was given a clean bill of health. The 5.4-liter 8-cylinder engine puts out 345 hp and is backed by an automatic transmission. 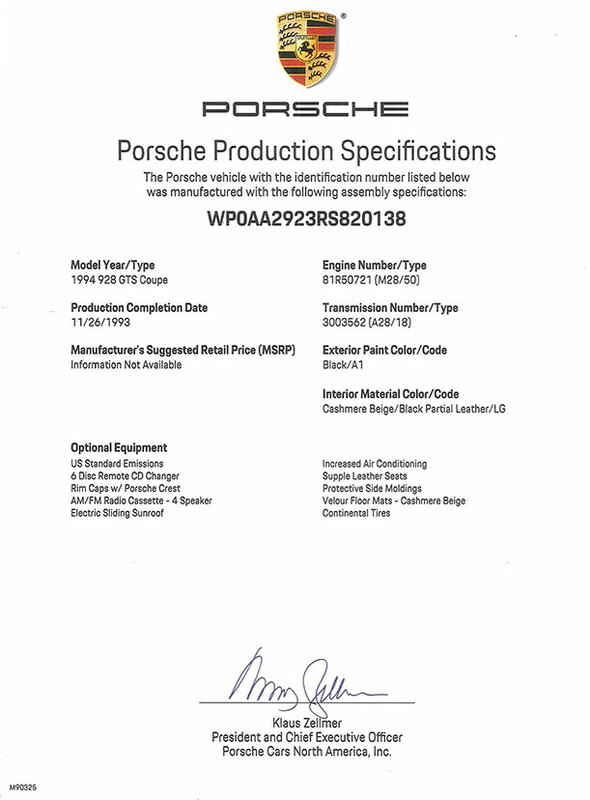 It is stock, very original, and is dressed in an elegant black over tan interior. Today, this sporting Porsche remains in highly original and extremely well-preserved condition, covering less than 64k miles since new. These powerful V8 Porsches offer a massive 369 ft lb/500 Nm at 4250 RPM and is are well-balanced sports cars that should be recognized as one of the all-time greats from the Stuttgart manufacturer. This extremely well presented, low-mileage example deserves a serious Porsche collector. Unveiled at the Geneva Salon in 1977 and voted Car of the Year for 1978, the 928 was intended as an upmarket replacement for the long-running 911. The front-engined 928’s stylish hatchback body featured aluminum doors, bonnet and front wings in the interest of weight saving, while ingenious impact-resistant bumpers made of color-matched plastic were incorporated into the nose and tail. The V8 engine — Porsche’s first — displaced 4.5 liters and produced 234 horsepower. A 5-speed transaxle gearbox or 3-speed automatic were the transmission options. In 1989, Porsche moved the game on with the even more powerful 928 GT which, with a top speed of around 170 mph, was the Stuttgart firm’s fastest production car at that time, before launching the model’s ultimate incarnation: the 928 GTS. Introduced at the Frankfurt Motor Show in 1991, the latter boasted a 5.4-liter engine producing all of 345 horsepower, and in this form the 928 lasted in production until the model’s deletion in 1995. Porsche has not made anything like it since, and today this appreciating modern classic enjoys an enthusiastic following worldwide.